Geologist measuring fracture orientation in the Jurassic Morrison Formation at Aneth oil field. Climate change, caused by elevated levels of greenhouse gases such as carbon dioxide (CO2) in the atmosphere, is a growing national concern. The U.S. Department of Energy has established seven regional partnerships across the nation to research and develop technology, infrastructure, and regulations to store (or sequester) large volumes of CO2 that would otherwise be released into the atmosphere. 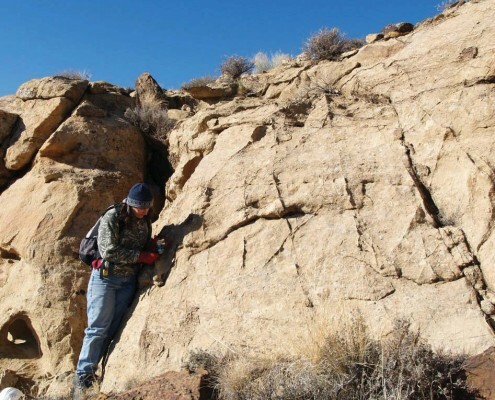 Geo-sequestration—long term storage in underground geologic formations—is one proposed way to reduce CO2 levels in the atmosphere. 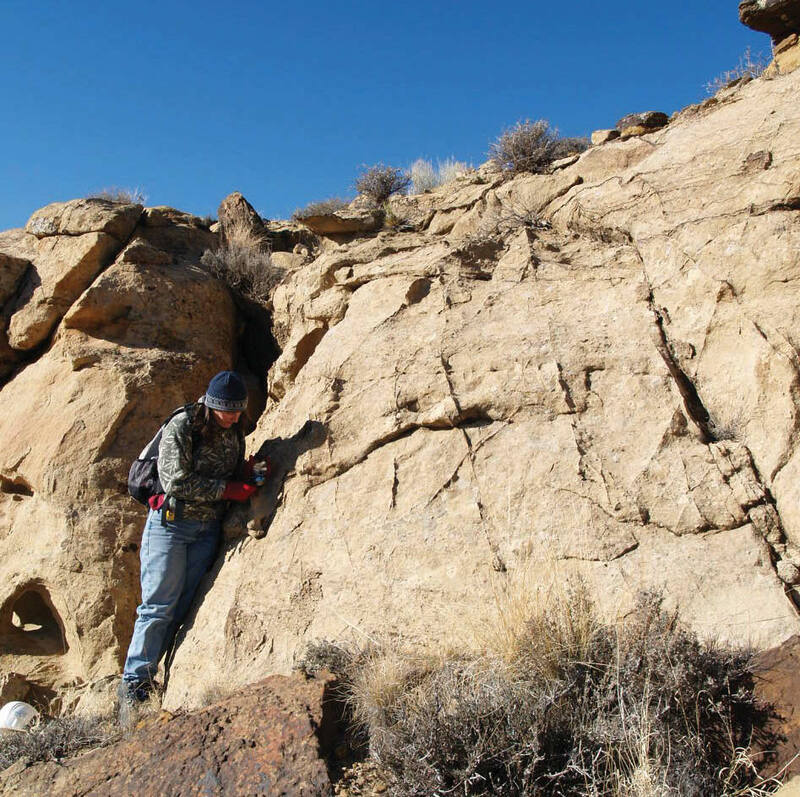 In 2005, the Utah Geological Survey (UGS) joined the Southwest Regional Partnership (SWP) for Carbon Dioxide Sequestration, which consists of several partners from industry, university, and federal and state agencies. The SWP has developed three geo-sequestration research sites, one of which is at Greater Aneth oil field in southeastern Utah. Greater Aneth oil field, which is the state’s largest, has produced over 450 million barrels of oil since its discovery in the 1950s and continues to produce today. As production has declined over the years, operators have employed enhanced oil recovery (EOR) techniques to recover as much oil as possible from the producing rock layers, or reservoir. Such techniques include injecting water and gases like CO2 into the reservoir to mobilize and push remaining oil out of the reservoir. 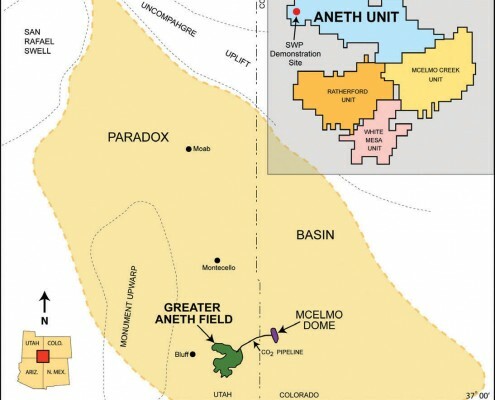 The Aneth Unit site, part of Greater Aneth field, was chosen by the SWP for a demonstration project because this technique was already in practice in other parts of the field, and a pipeline system was in place that supplies CO2 from a nearby, naturally occurring source in southwest Colorado (McElmo Dome). The goals of the demonstration project are to inject CO2 into an area of the reservoir where EOR has not been undertaken before, monitor where and how the gas moves, determine whether the reservoir at Aneth Unit and others like it are safe sequestration sites, and demonstrate that CO2 can be sequestered while increasing production in a mature oil field. Before injection of CO2 began, the UGS performed several field analyses to help determine whether the project area was geologically suitable for sequestering CO2. One main objective was to determine if any faults or other fractures occur in strata of the Aneth Unit area, as they can be potential migration pathways for CO2 to leak from the reservoir to the surface. First we mapped the surface geology to determine if any faults or fracture systems are present within surface formations. We then mapped subsurface formations focusing on ground-water aquifers, the oil reservoir, and the reservoir seal to determine if any faults are present at depth. The reservoir seal is an impermeable layer above the reservoir that keeps reservoir fluids from migrating to the surface. If any surface faults link with subsurface faults cutting the reservoir seal or reservoir, then CO2 could migrate or leak to the surface. Or, if any faults connect the reservoir to the ground-water aquifers, then this could lead to CO2 contamination of aquifers that are critically important to the local communities of Montezuma Creek and Aneth. Our work shows that no major faults occur in the area. We did, however, find several thousand fractures in surface rocks. These fractures, called deformation bands, are small and are confined to the sandstone units of the Morrison Formation. We observe no evidence of these fractures penetrating into the subsurface. Based on these results, migration or leakage of CO2 from the reservoir to the surface along faults is unlikely and there are no fault or fracture connections between the reservoir and ground-water aquifers, so CO2 contamination of the aquifers is unlikely. Injection and monitoring at the Aneth Unit demonstration well site began February 1, 2008, but injection for EOR elsewhere at Aneth Unit began in the fall of 2007. As of March 2009, about 28 billion cubic feet (BCF) of CO2 has been injected into the Aneth Unit site, with approximately 0.7 BCF injected into the SWP demonstration well. 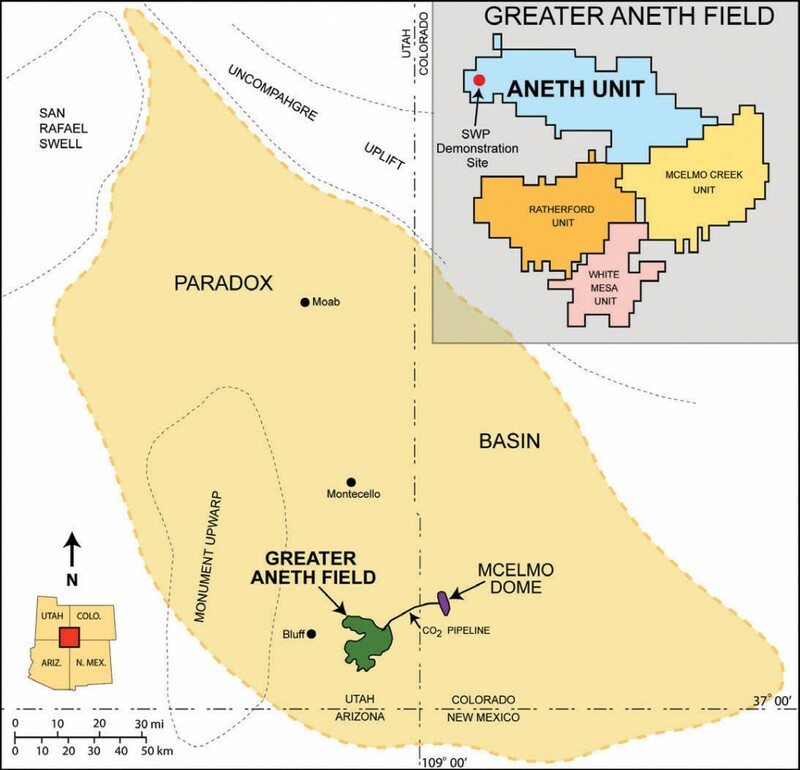 The operator at Aneth Unit, Resolute Natural Resources, reports an overall increase in oil production at the unit indicating a successful start for their EOR project, and no CO2 leaking or contamination has been detected. The SWP CO2 sequestration demonstration project is on schedule, and monitoring will continue through the end of this year. Injection of CO2 for EOR will continue at Aneth Unit after the SWP sequestration project ends, but from our demonstration project, we hope to gain insight into the fate and long-term storage effects of CO2 in mature oil reservoirs.